Transferred from the Office of Alumni Records in 1983 (Accession 1983:23). The records are organized in four series: Professors, Teachers, Officers, 1749-1942; Honorary Degree Recipients, 1757-1940; Military Service; Faculty Research Collection. All series, except the last, are arranged alphabetically first by topic heading, when applicable, and then by personal name. The last series is arranged chronologically, then alphabetically by name of faculty member. The compiled indices that comprise this collection were created by the Office of the Recorder and the Office of Alumni Records. The Office of the Recorder was formed in 1912 as an outgrowth of the Publicity Bureau to serve as an agency to coordinate events and activities at the University of Pennsylvania as well as collect, preserve and promote the history of the University (for more on the history of this office see the Guide to the Office of the Recorder Records). 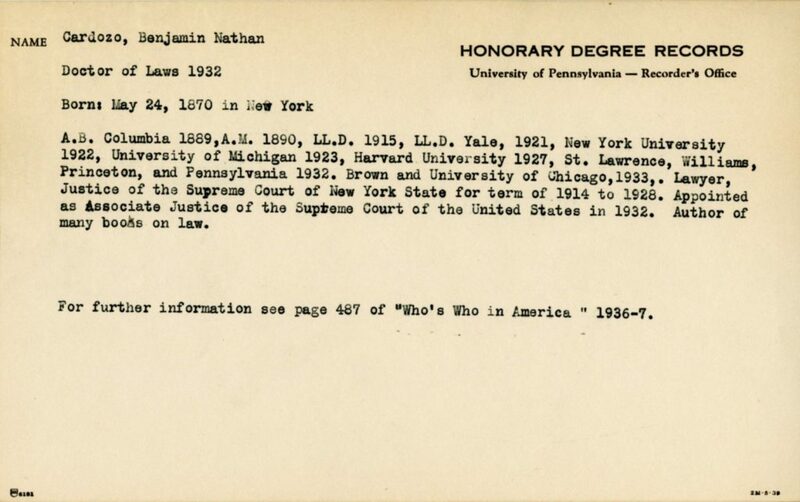 It is in this latter capacity, the Recorder, George E. Nitzsche, created a card index of all individuals who served officers, professors and instructors at the University of Pennsylvania from 1749 to 1942 and who received honorary degrees between 1757 and 1940. In addition to recording University service, Nitzsche also compiled a “World War Records” which listed students who were enrolled in the ROTC program during World War I. The Office of Alumni Records was formed in 1927 as an outgrowth of the Department of Lists of The Pennsylvania Fund campaign (for more on the history of this office see the Guide to the Office of Alumni Records Master Alumni File Collection). In addition to maintaining the mailing lists and biographical files of alumni, the Alumni Records staff took over some of the historical list compilations formerly handled by the Office of the Recorder. During World War II, the University of Pennsylvania decided to keep track of the military service of its students, alumni and faculty. 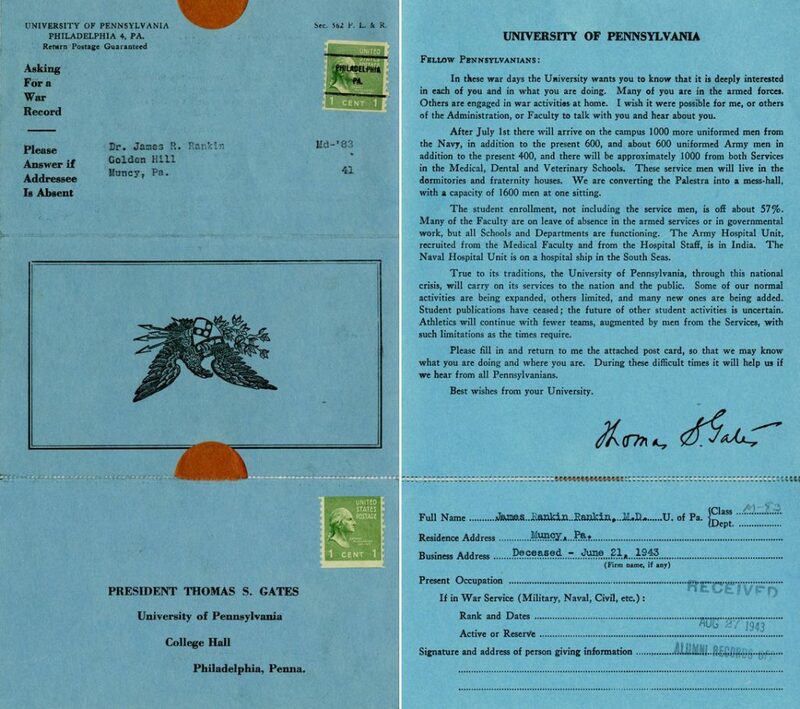 In 1943 a questionnaire in postcard form was developed and mailed out to all the alumni requesting them for information. The cards were returned to the Alumni Record Office and filed in the biographical files of alumni and used to create a separate card file for war service. The Alumni Record Office started to create similar list for those who served in the Korean War but this was never completed. The collection documents on index cards the service provided by individuals as officers and teachers at the University of Pennsylvania from 1749 to 1942, as military personnel to the United States military during the wars of the first half twentieth century, as contributors to the larger world of learning. The index of Professors, Teachers, and Officers contains information on the specific title, dates of appointment of individuals, degrees held, and occasionally dates of resignation and death. The cards cover the period from 1749 to 1942 and surnames Bra to Z. The cards for the surnames A through Bo were previously interfiled in the Office of Alumni Records Biographical Files (UPF 1.9AR). The index of Honorary Degree Recipients contains the name, date and type of degree conferred between the years 1757 and 1940. The military service records have a variety of detail. The World War I cards list only students who were enrolled in the Reserve Officers Training Corps, with the name of individual the date and expected degree he would receive at the end of the course of study and occasionally the name of the training camp he attended. The cards for World War II are more extensive. They cover alumni, students and faculty of the University who served in the war. The card lists the name of the individual, address, school and class affiliation, type, dates and location of military service and are grouped into categories for men, women, deceased or missing soldiers and prisoners of war. The cards for men’s service with surnames beginning with A through Com and Malk through Shr are missing. Coverage of the service of students and alumni during the Korean War is not complete. These cards contain the name of the individual, address, school and class affiliation, and some basic information on the type, dates and location of military service. 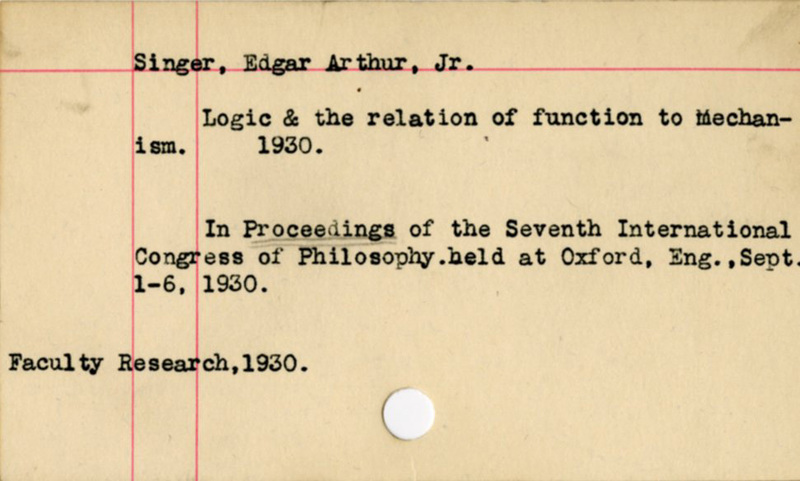 The Faculty Research Collection cards documents the publication of books and articles in journals by members of the faculty of the University of Pennsylvania primarily from 1928 to 1937 with additional cards going back to 1899 and forward to 1965. The cards contain the name of the author, title of the article and book. Gansman – Harris, James C.
Harris, James R. – Jones, Benjamin C.